The undisputed First Couple of Mexican art are Diego Rivera and Frida Kahlo. When they got married Diego was 42 years old, 6’1″ and was 300 pounds; Frida was 22, 5’3″ and 98 pounds. This caused them many problems as people often got them mixed up and some people even thought they were twins. This was strange because they actually looked quite different. Frida suffered polio in her right leg from childhood and later, at the age of 18, was involved in an horrific traffic accident in a bus. She had some 30 operations in her lifetime in an attempt to correct the damage. She was sometimes wheelchair-bound. Diego just ate a lot. By the time of their marriage Diego was an established, world-class painter of murals. For a big guy he was incredibly industrious. When he was young he lived in Paris and painted in a Cubist manner, much like every other ambitious artist in the world. At one time he got very angry at Picasso for “stealing” one of his “inventions”. In his painting Zapatista Landscape he developed a way of painting foliage by scumbling (i.e. dragging the paint over an undercoat – see the trees in the background). He kicked up such a stink that Picasso eventually painted out most of the scumbled sections of the large painting he was working on. I can understand Rivera’s feelings but it was a bit rich. Picasso, along with Braque, had invented Cubism and virtually everyone at that time was painting in the style he had created. 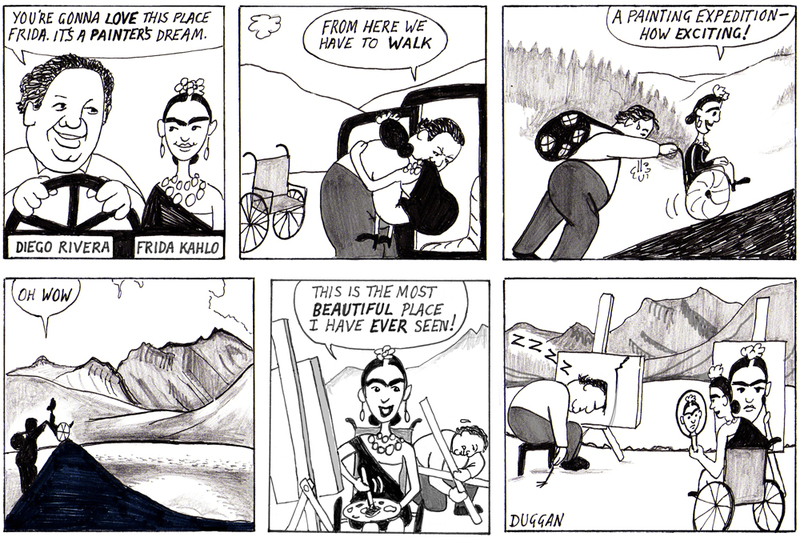 The gag in the cartoon rests on the fact that Frida Kahlo painted mainly self-portraits. As she said, “I paint self-portraits because I am so often alone… because I am the subject I know best.” This could leave the wrong impression of a retiring recluse. She was actually very outgoing, beautiful and intelligent and was considered one of the most desirable women of her day. In 1939 she even appeared on the cover of a French edition of Vogue magazine. The story of her marriage to Diego is fascinating to the point of exhaustion. Someone should make a movie of Frida’s life. Salma Hayek would be perfect. I am quite fond of this cartoon. The humour doesn’t overwhelm the tenderness. That’s nice isn’t it?